Care to witness an automotive compromise of epic proportions? Lop the lid off a supercar, and watch the purists wail. The act is borderline heretical because the bracing needed keep the body stiff usually counteracts the aggressive weight savings in these otherwise featherweight cars — a banal sacrifice in performance for what is essentially an extra dose of vitamin D.
The blokes at McLaren averted that fate by engineering their track-ready 650S as a convertible from the ground up. The prescient design involves a carbon fiber chassis with modular construction that makes additional strengthening unnecessary. A two-piece power-operated folding hardtop adds only 88 pounds — chump change for a car that tips the scales at 154 fewer pounds than its already wispy Italian foe, the Ferrari 458 Spyder — and body stiffness is said to be only incrementally less. My time with this British roadster started on the supercar-clogged streets of Beverly Hills, where it competed against a steady flow of competing exotics. The tester in question, finished in a stunning metallic volcano red paint that appears about 30 feet deep, manages to hold its own against this ever-changing backdrop of fantastically shaped rides. After all, in a landscape dominated by prancing horses, angry bulls, and Zuffenhausen crests, this high-dollar alternative hails from a relatively unknown British manufacturer better known for its Formula 1 racing victories than its roadgoing sports cars, making it the equivalent of an indie flick that battles the summer blockbusters. Head a few miles north from the showboating epicenter of LA’s west side, and you’ll t-bone the legendary Mulholland Highway, a whimsically jagged wire of blacktop that links the Pacific coastline to the heart of the valley. Within city limits, Mulholland is just about the only place the McLaren’s nasty side can be explored, and appropriately enough, a scenic one that begs for open-air driving. As such, the 650 Spider’s roof takes 17 seconds to deploy, with a rear window that drops at the push of a button to reveal much of why this race-inspired creation can approach the $350,000 mark: housed in the car’s structurally stark carbon backbone is a screaming twin-turbocharged 3.8-liter V8, which produces nuclear reactor levels of power from a space the size of an Igloo cooler. It revs to 8,500 rpm, churning an incredible 641 horsepower and 500 lb-ft of torque — which you’d never know when loafing around town, as its low speed manners are eerily smooth, sedate, and unassuming. Tackling the Mulholland corridor requires equal parts patience and restraint; though motorists can putter along here at agonizingly slow speeds (especially when wielding a Toyota Prius, for whatever reason), the road is also tight enough to make safe passing a virtual impossibility. But when open, Mulholland can be nothing short of glorious, offering a rhythmic flow of twists, turns, and elevation changes that make it resemble a 50 mile proving ground for the speed-inclined general public. During those rare moments, the 650S plays willing accomplice to the driver and road, revealing an incredible capacity for gripping, ripping, and lunging its way forward with seemingly magnetic adherence to tarmac. Dip into the meaty part of the V8’s powerband — which begins at around 3,500 rpm and stretches to the 8,500 rpm redline — and the car feels indomitable and insistent, its body barely pitching as it lurches ahead. On level ground, the 650S can launch to 60 mph in under 3 seconds, and that accelerative force makes it feel even more rollercoaster-like in the mountainous bits. Pro tip: Keep the rear window down during top-down motoring. Sure, some turbulent backdraft creeps into the cabin when barreling through those bodacious curves, but the payoff is the basso profundo howl from the V8 (along with near-instantaneous shifts from the dual-clutch gearbox) that makes you feel like you’re in a razor’s edge battle for 1st at Le Mans, not making hay of a gap in traffic on a pretty b-road. Though not nearly as showy as its rivals from Ferrari or as steeped in street car legend as Porsche, McLaren’s latest is an achievement in speed-focused functionality in an age when some supercar builders have lost the plot by being everything to everyone. 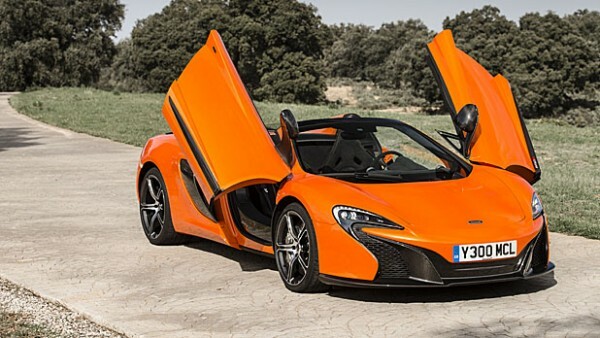 By doing its track-focused ancestors proud with its razor sharp skill set, the 650S Spider packs an extra wallop with its nearly-no-compromises open air configuration, making it a guilt-free way to savor the sun while basking in the G forces.